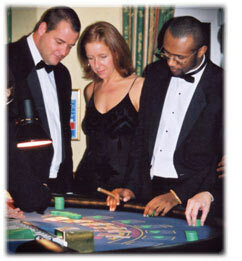 Vegas Nights - All the rules for our casino night games - Blackjack/Roulette/Poker. f you have ever played 'Pontoon' or '21', then the basic principles of Blackjack will not be new to you. What makes Blackjack different from these other games is the incomparable casino atmosphere in which it is played and the addition of several playing and betting options, which are explained here. Blackjack is played between you and the dealer. The object is to draw cards with a value totalling 21, or as near as possible to 21 without going over the top, 'going bust' and losing. The first ace of a hand counts as eleven, picture cards ten and other cards, their numbered value. However, where a hand contains an ace and the addition of further cards would bust the hand, the ace is counted as one. Four packs of playing cards are shuffled by the dealer, who acts as banker, and then cut by one of the participating players before being placed in a dealing box, known as a 'shoe'. You make your bet by placing your cash chip in the nearest of the boxes to where you are sitting. Some players like to play two or more boxes simultaneously. Never forget you are playing against the dealer, and you need to assess the chances of his hand exceeding 21. The dealer must continue taking cards up to a total of 16, and cannot take any more cards once his hand has reached 17 or more. The skill factor comes in judging when to stick with your own hand. You may take additional cards, at your option, up to a total of 21 before the dealer takes his second or subsequent cards. If your hand exceeds 21, then you have lost your bet and you take no further part in the hand, even if the dealer subsequently exceeds 21 as well. If your total is nearer to 21 than the dealer, then you win, and are paid even money. If not, then you lose. The same score is a tie and counts as a 'stand off'. You neither win nor lose. If you have a Blackjack - which is an Ace together with a picture card or 10, you win one and a half times your stake, unless the dealer also has a Blackjack, in which case, the bet is a 'stand off'. There are several options you may take in Blackjack after you have been dealt your first two cards. You may double your original stake on your first two cards, and only one further card is dealt to your hand. If your first two cards make a pair, you may split them into separate hands but must repeat your original stake on the second hand. If the next card dealt to any split hands also makes a pair, then these subsequent hands may not be split. If the dealer's first card is an Ace and your first two cards total 21 (i.e. a Blackjack), then you have an option to take out insurance against the dealer's second card also giving him a Blackjack, which would produce a 'stand-off'. You may in these circumstances place up to half of your original stake on the insurance line which becomes a second bet. If the dealer draws a Blackjack then the insurance bet wins at 2 to 1 and your original bet is a stand-off. If the dealer fails to produce a Blackjack then you forfeit the insurance stake but your original stake will win at 3 to 2. A more practised method of handling this is to accept the dealer's invitation to take even money on your original bet before his second card is drawn, as this has the same effect, irrespective of whether the dealer obtains a Blackjack or not. here's something about chance, as typified by Roulette, that people find utterly fascinating. Perhaps it's the fact that everyone at the table starts on equal terms with each spin of the wheel, or simply the great atmosphere that builds up around every Roulette table when the wheel is spun and the ball finally drops into the winning number. Roulette is a fast game, so if you've never played before, just watch for a while and soak up the atmosphere. Then, when you feel you're ready, step forward, place your bet and experience at first-hand the magic of Roulette. When you first set eyes on the table, and watch people placing their chips, it may seem complicated, but it won't take you long to pick it up. Here we explain the basis of the game, but there's no better guide than actually getting over to the table and watching. Uniquely, Roulette can be played with either "Cash Chips" or "Colour Chips". Colour chips which have no value printed on them are simply given to distinguish your chips from other players to avoid confusion. Nobody else will be using your colour whilst you are using them. These colour chips may not be played on another table and the values are normally the minimum of the table, unless you state otherwise. At the commencement of play, simply tell the croupier what you would like. Say to the croupier "Colour Please". When you finish and want to cash the chips, all you do is tell the croupier "Cash in please", pointing to your chips. The croupier will take your colour chips, count them in stacks and give you a ticket which you can take to another table or hold onto to win a prize. When playing Roulette, you may place bets on any number or combination of numbers; on red or black; on odd or even; or even high or low. The wheel contains 37 numbers - 18 red, 18 black, and '0' (zero), which is coloured green. The croupier spins the wheel in one direction whilst spinning the ball around the 'bowl' from the other direction. Where the ball ends up is pure chance, and that's what makes the game so exciting. A bet on red or black, odd or even, 1 to 18 or 19 to 36, pays even money. Groups of twelve numbers, in sections, or in columns will pay 2 to 1. Any one number including 0 (zero) pays 35-1. Any one of the six numbers in a group, pays 5-1. Any one of the four numbers in a group, pays 8-1. Any one of the three numbers in a group, pays 11-1. Any one of the two numbers in a group, pays 17-1. When 0 (zero) is spun all bets loose. asino Stud Poker is a new, enjoyable alternative to the established casino games. It is based on five card stud poker and whether you're an expert or know nothing at all about the normal game of poker, you'll be playing Casino Stud Poker with style within minutes. 1. How much shall I stake for my initial bet? 2. Is my hand good enough to raise? A standard deck of cards is used for this game. To play you simply place an initial bet in the box marked 'ante'. Unlike Blackjack you are not permitted to play more than one hand. When you and all the other players have placed an initial bet, the dealer will deal five cards to each player and five to himself. The last card of the dealer is placed face upwards and this will help you to make your next decision. This is because the dealer's hand only qualifies if it contains an Ace and a King or better. Pick up your cards and review the prospects of beating the dealer. If you decide to fold you lose your ante bet. Hopefully your hand will be good enough for you to wish to continue.